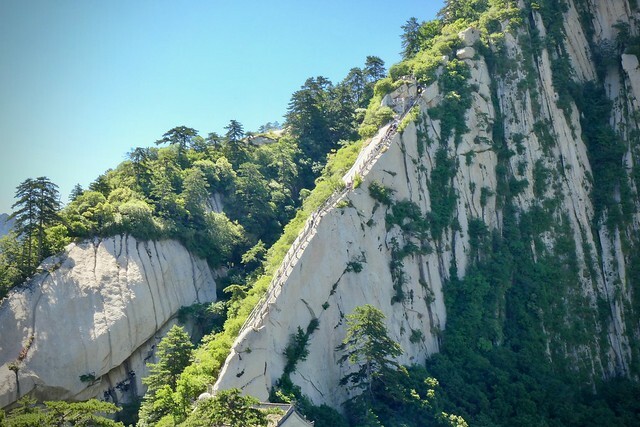 Hua Shan or Mount Hua, is located in China, in the province of Shaanxi and is one of the five great Chinese Sacred Mountains, which for centuries have attracted pilgrims from all over the world. Its height is 2,160 meters above sea level and it is possible to climb to the top through a path, considered as the most dangerous and steep of the world. In addition to the foot-path, you can take the cableway that offers breathtaking views, but certainly, the satisfaction in reaching the summit will not be the same. 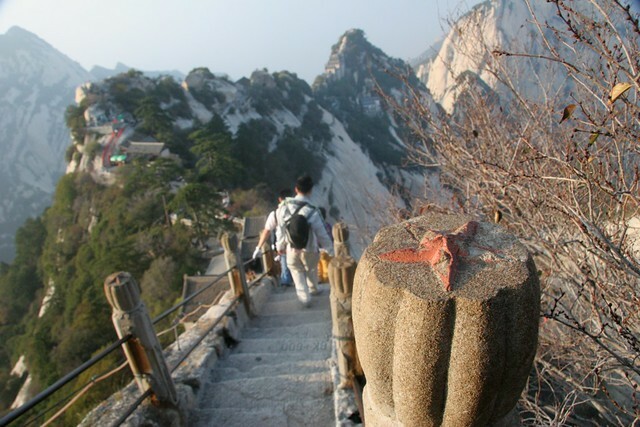 A first part of the Path of Hua Shan consists of steep stairs which even if at first sight can scare, believe me, is the best part of the whole route. 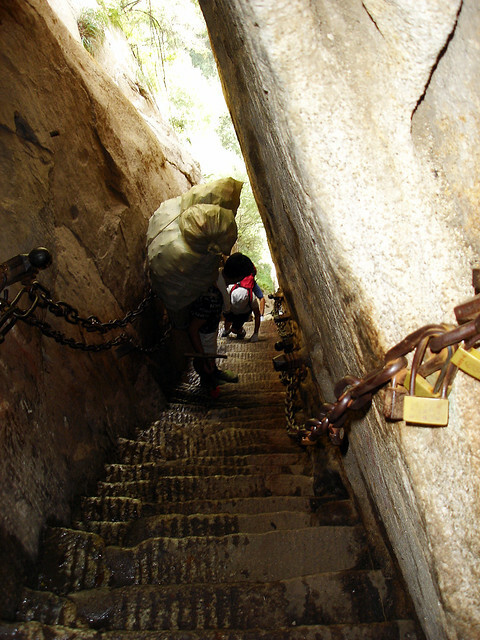 The most dangerous section, on the other hand, is known as "Changong Zhandao", only 30 centimeters wide, the passage is possible on wooden beams placed along the rock fixed with nails and spun iron, the only grip to lean on consists of a chain running on the side of the mountain, however, there are security structures that can be locked, but there is no obligation and people can also choose to make the route of Hua Shan without any protection, a misstep and you will fall down. 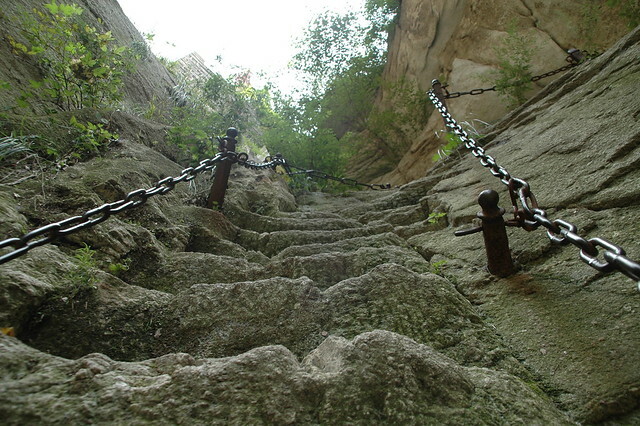 But the surprises do not end here, the path of Hua Shan becomes increasingly difficult and dangerous, as the stretch where the wall of the mountain is almost vertical and you must climb on dilapidated steps that are nothing more than metal bars fixed in a crack of the mountain, to climb the only holds are rusty chains. In winter, then, snow and ice make the climb even more difficult, almost impossible sometimes. 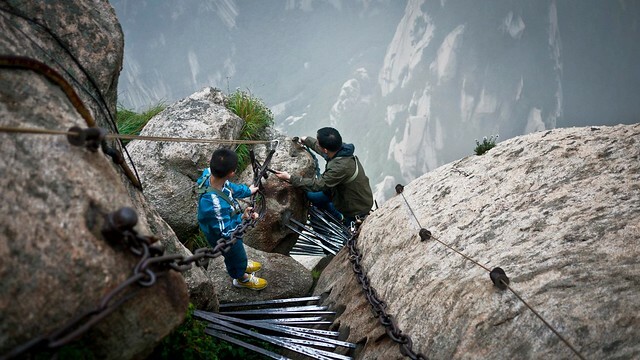 Some stretches of the path of Hua Shan are so dangerous that they should only be accessible to climbing experts and only with the necessary harnesses, in some places you must literally make the tightrope walkers on old chains or use the grooves dug into the mountain. Every year there are many people who, although not physically prepared, decide to undertake this physical and spiritual enterprise, because reaching the summit must be a beautiful sensation. Side to the trail, especially in the first stretch of Hua Shan, there are Taoist Temples, their construction has been the cause of death for many people, if it is already difficult to climb concentrating only on not falling, let alone how much must have been carrying heavy materials like timber, stones and more. As soon as you arrive on top, you can observe the huge amount of padlocks and red ribbons hanging everywhere, in fact it is even possible to find small street stalls selling padlocks on which to engrave the names of loved ones and to attach to the many chains present as a sign of good wish for the future. The same stalls also sell terry gloves, many people who take the Hua Shan Path either by forgetfulness or because they do not believe they are needed, come without them. 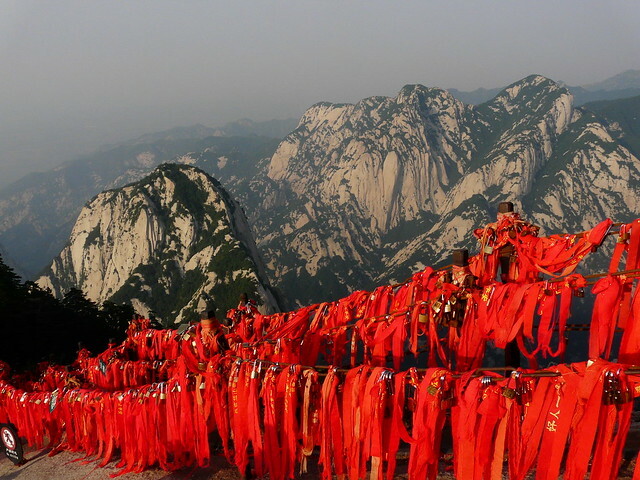 The path of Hua Shan, starts from the homonymous village at the foot of the mountain, and has a total duration of about 10 hours, at the end of the path you reach the Taoist Monastery, where in addition to delight with the panorama, you can enjoy a good cup of hot tea.